The Fethard Horse Country Experience museum, located in County Tipperary, Ireland, was officially opened by Minister with Responsibility for Defence, Paul Kehoe TD and Lord Lloyd Webber on Tuesday, May 30. A €1.6-million investment, the museum–developed by Event Communications in the town’s 400-year old Tholsel building (town hall)–will allow the town to be a key destination in Ireland’s Ancient East, the tourism initiative launched last year by Failte Ireland, while exposing visitors to the rich culture and heritage of the region with an interactive exhibition bringing to life the local history and evolution of Ireland’s world-class bloodstock industry. In conjunction with the Fethard Business and Tourism Group, the community led project will create a tourist attraction that will increase tourism in the Fethard region. 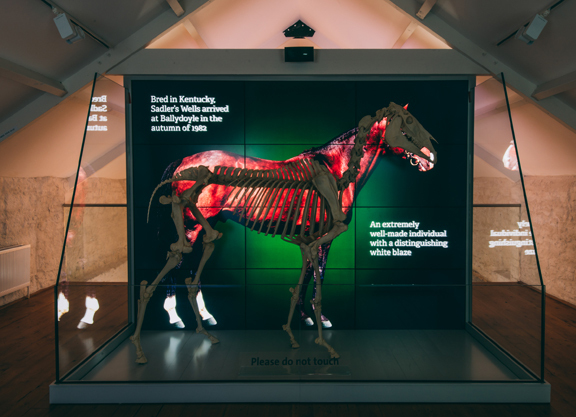 Nearby Coolmore Stud, currently producing top-shelf bloodstock and home–during his life–of Sadler’s Wells (Northern Dancer), a 14-time champion sire in Great Britain and Ireland, has also been a contributor to the museum, with that stallion’s skeleton on display in one of the exhibits. Supported by Failte Ireland and receiving €198,000 in funding, from the ‘New ideas in Ancient Spaces’ Capital Grants Scheme for attractions within Ireland’s Ancient East Initiative, the project also received funding from the Tipperary County Council, Leader Programme, the Magnier family and private donors. The trustees of the Andrew Lloyd Webber Foundation awarded a one off grant towards the employment of a curator for the museum, who will manage the contents of the Fethard Horse Country Experience. The hours of operation for the Fethard Horse Country Experience will be Wednesday-Sunday from 10:00 a.m. to 4:00 p.m. local time. Addmission will start at €5.00 until Aug. 31, before rising to €7.50 thereafter.